For people who are lucky enough to enjoy a recreational vehicle during the summer (or winter for that matter) you understand that owning a recreational vehicle is not without its chores. You don’t just put it into storage for the winter and then take it out, start it up and hit the road. The process of taking your RV out of short term storage is more involved. 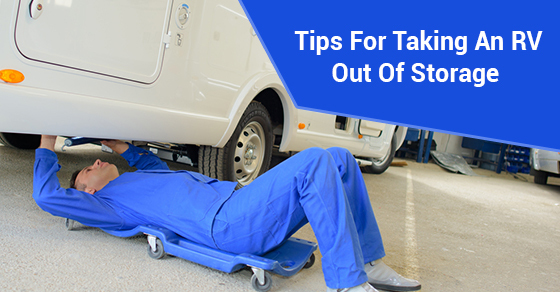 It requires some special know-how to ensure the vehicle is safe and ready for use. Below are four tips for taking your recreational vehicle out of storage. The owner’s manual is there for a reason: to teach you everything you need to know about safely and responsibly operating your vehicle. The first thing you should look at once your RV comes out of storage is the owner’s manual. It is always wise to inspect your RV for any fluid leaks, and diligently check the hoses and wires to be sure they haven’t cracked in the winter temperatures, and that no pests (like rats, mice and squirrels) have chewed on and permanently damaged them. Your clamps should be tightened, the vehicle’s tires inflated and all repairs made ASAP before you can consider it road ready. After sitting in short term storage all winter, you will probably have some dirt, dust and grime to deal with before your RV looks neat and tidy again. It is important that your RV be high functioning, but you also want it to shine while it is out on the open road. You should pay special attention to the windshield, hard surfaces and windows, not only so you can see out of them, but so that your RV looks fantastic. Taking a vacuum to the upholstery and floor won’t hurt either. Removing the battery from any vehicle before putting it into short term storage is always a must. Before you put the battery back, make sure that it is fully charged (simple, if you’ve kept it attached to a charge maintainer all winter). Take a good look at the terminals and cables as well to make sure there hasn’t been any corrosion that requires attention, and remove any dirt and grime that has accumulated. The goal is to get your RV back on the road as soon as humanly possible once the nice weather arrives, because it won’t last forever. Before you do that, however, keep the above tips in mind for removing your RV from storage, so you can make sure it’s safe to use, and have it looking great before you start it up again.